This lovely 4-Bedroom Home, in the Estates Tract in the community of Portola Hills, Lake Forest California is all about the awesome views. What a perfect way to see them at a Twilight Open House. Kelly Turbeville will be holding this home open from 4pm-6:30pm Oct. 13th. 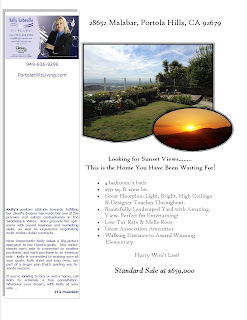 With only three Single Family Homes on the Portola Hills market we don't anticipate this home staying on the market very long. So make sure to come and check it out.